Cricket box - 19th century? This is another interesting piece I recently found. 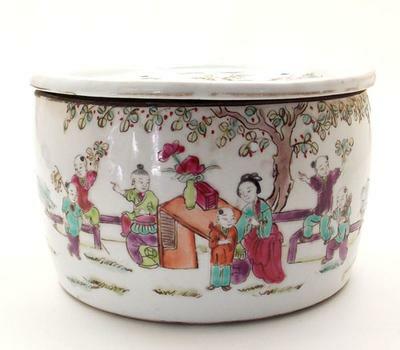 It is a large cricket box with a delightful scene of children playing. 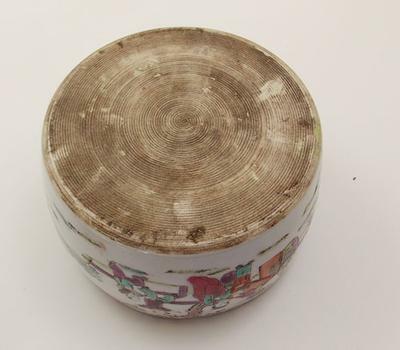 The jar is about 4 1/2 inches tall and 6 1/2 inches in diameter. The upper rim, inside of lid, and bottom are stained brown. The piece is slightly warped. The bottom has a spiral incising both inside and out. I just realized that there are 2 bats on the back of the piece that appear to have characters in them, will have to take more photos. It appears that the people on the jar were painted with a black underglaze and the colors were added in a later firing. The colors are slightly raised. I have a lot to learn about Chinese porcelain, but I don't think this piece was made for export. Comments for Cricket box - 19th century? I think this is a fake antique. A fake item is something that tries to reproduce an antique look in order to deceive buyers. 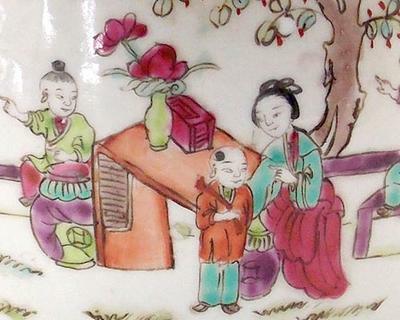 The decoration, especially the faces, seem to try to imitate late Qing dynasty people. But the colors used for Tongzhi/Guangxu items of this type would be different. They should be red. The top rim, interior and exterior bottom all are darkened in an unnatural way. Usually, this is a sign of faking. Many people associate this with old age but it is likely artificial. Often it cannot be removed at all. Another problem I have with this is the circular lines on the bottom. This could point to a metal (machine made) turntable used for throwing.